Here at McCluskey Automotive, we make selling used cars in Cincinnati, our business. The experience of purchasing a vehicle can be a rather daunting one, especially if you are purchasing a used vehicle. How do you know that the car you are buying today, won’t quit working, tomorrow? The truth is, there really is no way of knowing for sure what the future of your used car will hold. What you want to look out for the most during your used car shopping experience, is a reputable dealer. Here at McCluskey Automotive, we not only thoroughly inspect all of the vehicles we put in our lot, but we stand behind the vehicles we sell. If something goes wrong, you can rest easy knowing that we will still be here for you when you need us. Other road-side dealerships may sell you a car one day, only to have skipped town when something goes wrong. Don’t trust anyone else with such an important purchase. At McCluskey Automotive, we are selling you the best previously-owned vehicles, and bringing you the latest industry news. It’s no secret that the famous bowtie emblem is what sits on the front grille of every Chevrolet. The iconic symbol has become synonymous with the famous brand, and has been gracing Chevy vehicles since it first appeared back in 1913. Since then, the bowtie has undergone many transformations, finally landing on the golden bowtie you see in today’s Chevy vehicles. A new Chevy is in town, and with it, comes a new bowtie emblem that is just as sleek as the car it sits on. 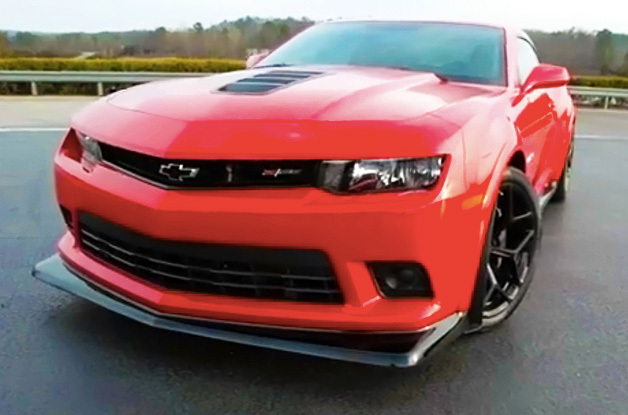 When the Powertrain Cooling Development team over at Chevy first tested the Camaro Z/28, the bowtie on the grille was forcing air away, rather than allowing it to hit the radiator. Richard Quinn, an engineer on the team, made the decision to make the Z/28’s bowtie hollow. The new “flowtie” can be seen in the picture above. What do you think of the newest rendition?